This absolutely amazing piece of jewelry from the 17th Century, is for sale through Bonham’s. It’s the brilliant Mughal Mirror diamond necklace, that has 5 pendant clear diamonds with gold and Emerald’s elegantly dangling down. The piece is priced at $20 million, and has been offered for private sale through Bonham’s. The central stone is an astonishing 28 CT’s and the surrounding stones are an incredible 96 CT’s! The five diamonds accompanying the emeralds, have been said by Bonham, to be the largest set of matching flat diamonds from 17th century India. The diamond cutting techniques visible on the gems are said to be extremely rare! The diamonds were believed to have been mined from the Golcona area, which is a region in the Deccan of India. The necklace is also believed to have been owned by the emperor of Mughal, which is the northern area of India that we know today. 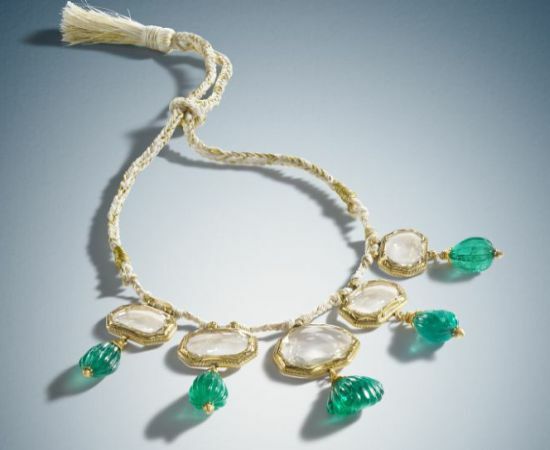 It is quite remarkable that the Mughal Mirror Diamond necklace has survived all these years, even with its old setting still intact, Bonham’s said. This piece is a rare masterpiece, don’t you think? This entry was posted in Diamonds, Jewelry History, Jewelry News and tagged bonhams, diamond and emeralds, mughal diamond necklace. Bookmark the permalink.